And Jesus must needs go through Samaria. Jesus therefore, being wearied with His journey, sat thus on the well. And there cometh a woman of Samaria to draw water: Jesus saith unto her, ‘Give me to drink’. How close are you to Jesus? How close is He to you? This woman was carrying out her common task.. filling a bucket with water. And Jesus was close to her. Jesus was just there, waiting for her – just as He is close to you, in all the chores and duties that fill each of our lives.. He is waiting for you, as you set about the menial tasks of each daily round. This woman went on a little local errand to draw water from a public place, but before she returned, she had met Jesus and had been refreshed. Before she went home, Jesus met her at the very point of her deepest soul need. She wasn’t openly seeking Him – except as in the unsatisfied yearning of every human heart, and yet He waits for her to come to Him – He waits to meet her deepest need. And He waits in all circumstance of life to meet the deepest longings of your heart, too. As we flap and worry and fret and concern ourselves with accumulating difficulties.. Jesus sits and waits. 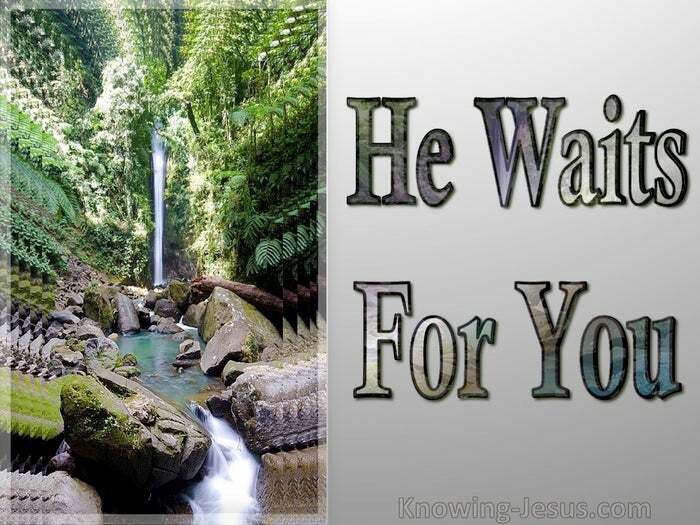 He waits for us to come to Him. As we plan strategies to meet all the heavy burdens that cause so many heartache.. Jesus sits and waits. He waits for us to turn to Him. As we desperately try to determine how to cope with life’s mounting troubles.. as we look for any form or escape from the downward spiral of the world’s affairs, Jesus waits and He waits. He waits for us to come to Him, to turn to Him. Behold, I stand at the door, and knock, if any man hear my voice, and open the door, I will come in to him, and will sup with him, and he with me. Rev.3.20. No-one finds the Lord Jesus in the path of disobedience.. He waits for us to come to Him He waits for us to obey His voice. “Give Me.. to drink”. – “Keep my commandments”. “Love as I have loved”. – “Trust in my love”. “Feed my sheep”. “Repent and return to your first love”. “Be thou faithful”. “Abide In Me…” Oh yes – He waits for us to come to Him. He waits for us to obey His voice. Jesus met this woman in the form of a weary, way-worn and thirsting traveller. Jesus took time and won His way into her confidence. Jesus took time to get her trust and to find a way into her heart. Jesus made Himself known to this woman through the garb of a tired, thirsty man.. and Jesus refreshed her soul.. and Jesus revealed the glory of His personality to her. Jesus offered her His love and His forgiveness.. and He waited to give her His refreshment. And she was saved and became His witness to her whole community. Jesus approaches each of us in different disguises and many unrecognisable ways. He seeks to get close to us, so that He can pour out His love all over our thirsty hearts. He waits to draw out our trust.. our love.. our faith and our obedience to Him. He then seeks to test our obedience.. our faith.. our love and trust in Him, before He drops His veil, and shows us His blessed face and reveals His presence. Can you trust Me to fulfil this need? He asks. Can you believe that I will carry that burden for you? He questions. Can you obey the Word that I speak, for My Word is life and health and peace. Can you give Me a drink of water? He inquires. He will not force His love on any one of us. He will just sit and wait – or stand and wait – or knock and wait. He will wait.. wait for us to come to Him. He will wait.. wait for us to open our hearts to Him, so that He can see into the depth of our need and longing – and correct and give and love. He waits for us to trust Him and He waits for us to truly have faith in His Word, despite some of our foolishly provocative remarks… (“I have no husband….. ” I can sort things out myself… I can do it MY way.) 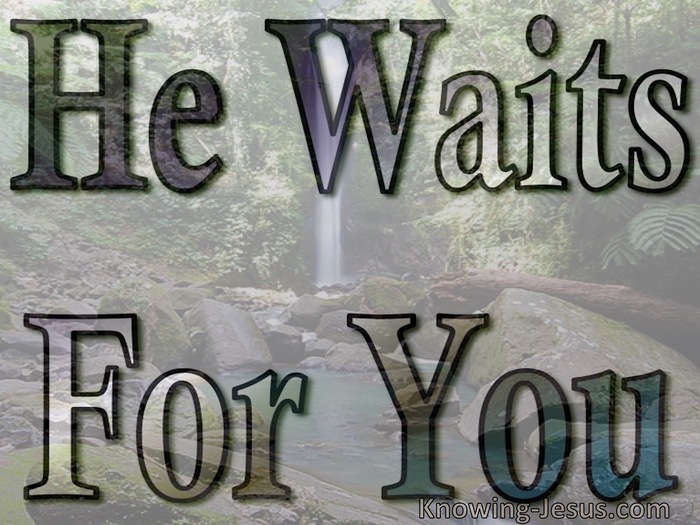 He waits – for us to admit our need of Him. He waits – for us to ask Him to give us the true and Living Water.. for He longs to pour out His love over your dry and thirsty life. Come – let him that is athirst COME.